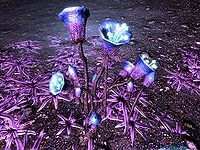 Gas Blossoms are a variety of carnivorous plant which can be found in Murkmire. The blossom part of the plant resembles a fanged mouth which splits into three "petals" when it opens, which contains a poisonous gas which the Gas Blossom releases when it senses prey or a threat. The rest of the plant is a mass of thick, tentacle-like roots which can easily burrow into most surfaces. Giant Lichen can be found growing in the swamps of Hjaalmarch, Skyrim. 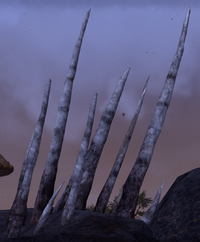 Giant Xylaria is a fungus that grows almost exclusively in the Ashlands region of Vvardenfell. 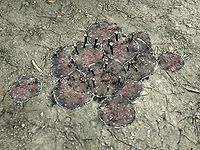 They resemble giant spikes growing out of the ground and accidentally walking into one would likely be fatal. 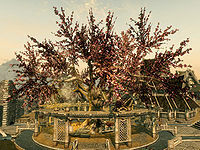 The Gildergreen is a holy tree found in the Skyrim city of Whiterun. It is sacred to worshippers of Kynareth, and is of great importance to the city's Temple of Kynareth. It was grown from a cutting or seedling (accounts vary) taken from the ancient Eldergleam. 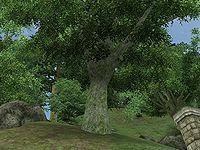 The Ginkgo tree can be found growing all over Cyrodiil and along the banks of rivers and lakes in Hammerfell. 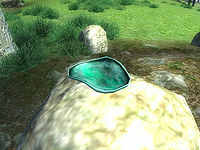 It can also be found in Inner Summerset, better known as Alinor. The half-moon-shaped leaves are said to be sweet. They were also found in Gaiar Alata before its destruction. Ginseng is a herb whose roots are harvested for their spice. There are two varieties; one with red flowers and another with yellow ones. They can be found in the Gold Coast and Nibenay Valley regions. 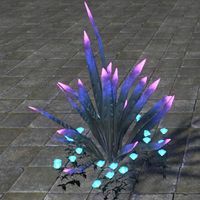 Gleamblossom is a purple flower found only within the Forgotten Vale. Gleamcaps are a variety of small mushroom which grows in caves, their name relates to the glittering effect that can be seen in its' spores. 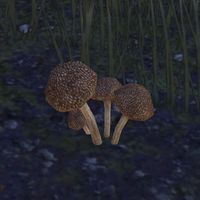 The mushroom is known to grow in Merion's Bliss on Auridon. Dark brown-black mushrooms with a bumpy texture and they are described to smell "rancid". 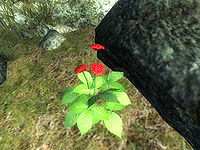 They only grow in area which have been tainted by Daedric incursion, such as the destroyed Gil-Var-Delle in southern Valenwood. The Gloom Morel is said to feed on decaying flesh. 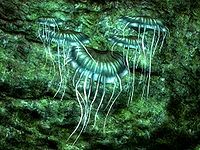 Luminescent, blue-green shelf mushrooms with long tendrils similar in appearance to jellyfish. 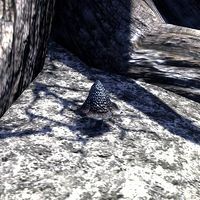 Found clinging to the walls of caves in Skyrim. 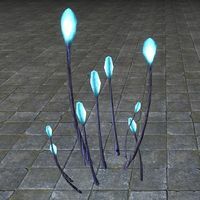 Glowstalks are plants that are native to Mainland Morrowind in the areas around Deshaan. They have a large stem with a ball at the end that gives off a natural orange lighting. 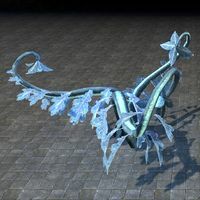 There are many varieties of glowstalks, including those found in the fertile Darkshade Caverns, the Spiral Skein, and Coldharbour. 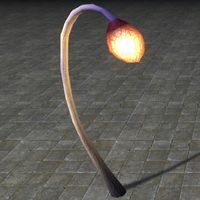 Glowstalks come in many shapes and sizes: towering tree-like bulbs with thick stalks, small growths resembling flower patches, and massive sprawling vine-like structures are among those shapes. 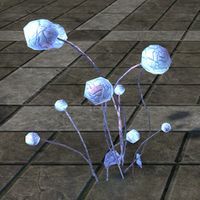 Gold Kanet is a flowering plant commonly found in the Ascadian Isles and on Azura's Coast. They are easily noticed due to their yellow petals. Roland's Tear is a rare variety of the flower which is highly sought after by alchemists. 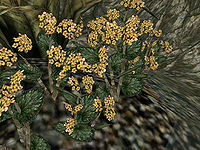 Golden Lichen is a lichen that grows in Vvardenfell. 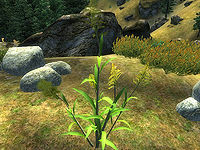 Golden Sedge is a flowering reed found in several places of Mournhold. 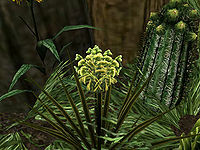 Goldenrod is a tall, yellow flowering plant with many short leaves, found around the Golden Coast of Cyrodiil. 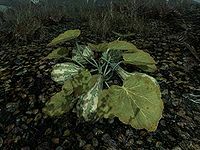 The gourd plant can be found throughout Skyrim and is commonly grown on farms for food. 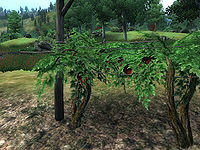 Grape vines are grown on farms and in the famous vinyards of Skingrad. They are raised from the ground by wooden stakes and ropes. 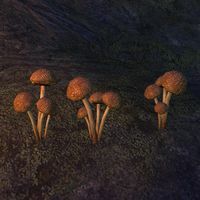 Graven Cap is a sweet-smelling mushroom found around Othrenis in the Stonefalls region. 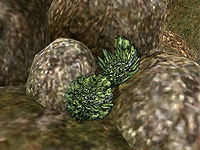 Green Lichen is a rare plant, mostly found growing on rocks in the West Gash region of Morrowind. Green stain cups are common aqua-green capped mushrooms. They are found in a concentrated number in the Blackwood region. 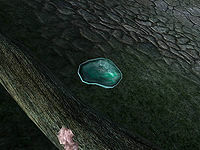 Green stain shelf mushrooms are a rare shelf fungi found on the sides of some rocks and trees in a small amount around Cyrodiil. ^ Gleamcap Spores item description. ^ Graven Caps item description. This page was last modified on 21 April 2019, at 19:09.